Dirty dishes stopping you from making your favorite dinner? Not anymore! All you need to make One-Pot Mediterranean Pasta is one pot and 30 minutes. Dinner just got a lot easier! Put away the colander and all of those extra pots and pans! 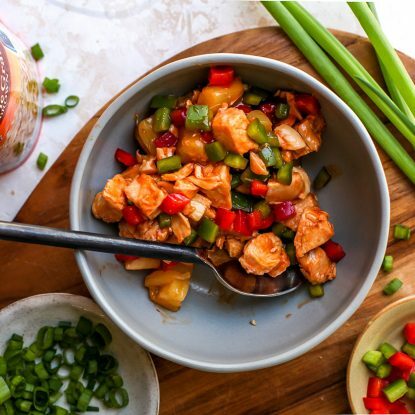 All you need is one pot and under 30 minutes to create this simple and delicious dinner! You don’t even have to wait for the water to boil. It’s just that easy! Cooking a nutritious dinner every night can be challenging. Simplify your evenings with One-Pot Mediterranean Pasta. It’s quick and easy with minimal clean up. Spend more time with your family and less time in the kitchen cooking and cleaning. Simply add your ingredients to the pot and wait. 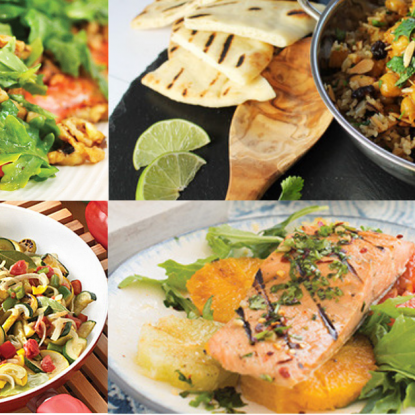 Dinner is ready in minutes with minimal effort and time. It’s like magic! 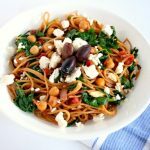 This One-Pot Mediterranean Pasta dish is packed with protein, fiber and color from the veggies, whole wheat pasta, and chickpeas. This pasta is great for vegetarians or for families trying to sneak in some plant based protein. 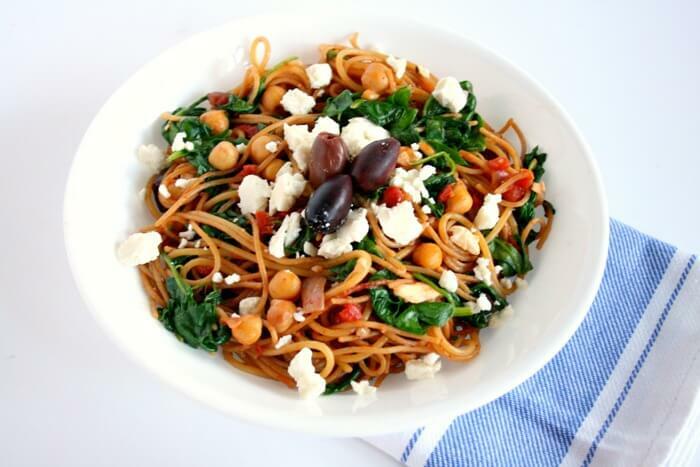 This Mediterranean pasta dish puts a flavorful twist on the classic spaghetti. 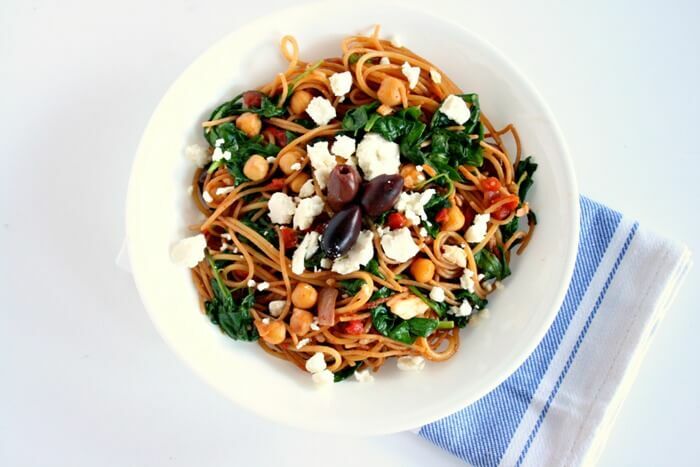 Made with garlic, tomatoes, spinach and topped with kalamata olives, chickpeas, and feta cheese this power packed bowl is full of flavor and nutritious ingredients. You can make it with regular noodles or whole wheat noodles. A trick that I like to use is to do half and half. You kids and guest won’t even know the difference! This dish is a great weeknight dinner dish, but it is equally as wonderful when entertaining. Make this for your next dinner party and spend time with your guest and not the kitchen! They’ll never know just how little time you spent preparing the dish. Add garlic and onion to the pan and heat until the garlic begins to brown and the onion turns translucent. Next add the stock, diced tomatoes, and oregano to the pot and stir. Finally add your noodles making sure each noodles gets submerged in the liquid and bring to a boil. Reduce heat to medium low and cook pasta for 6 to 8 minutes. Most of the liquids will have evaporated and you will be left with a light marinara sauce. Turn heat to low. Stir pasta and add salt. Slowly stir in spinach, one cup at a time. Spinach will quickly wilt into the spaghetti. Add garbanzo beans, 1/4 cup of feta cheese, and kalamata olives. Stir until well combined. Plate and top each with remaining 1/4 cup of feta cheese. Dirty dishes stopping you from making your favorite pasta dish? Not anymore! All you need to make my one pot Mediterranean pasta is one pot and 30 minutes. Dinner just got a lot easier! One pot meals are the best and this one looks great Holley! Can’t wait to try it! This sounds like a perfect one pot meal, I never think to cook pasta like that- must try! 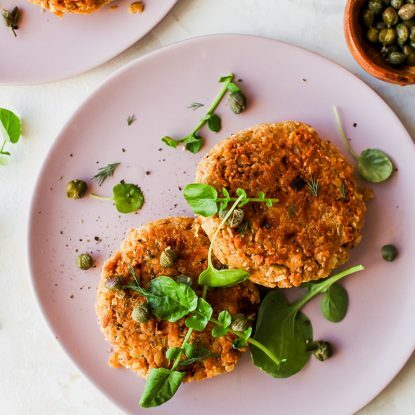 It’s such an easy way to make a yummy meal! Thanks, Tara! Let me know if you try it. So yummy!